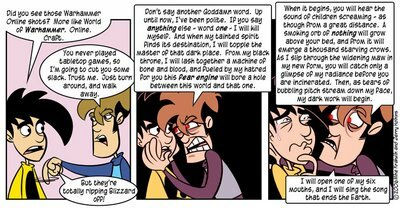 As you can see on the right, Monday’s Penny Arcade contains quite a bit of text. A veritable onslaught, one might say. Which is perfectly fine – the words themselves, as most ones chosen by Sir Tycho, are carefully and lovingly crafted to maximum effect. His writing, as always, pleases. That said, the writing was not what caught my eye in this strip. Even here, in a strip that is overflowing with words, it was the art that caught my eye. Despite currently being the artist of the most popular webcomic in existence, and despite having come a long, long way from where the comic began, Gabe often talks abouthis desire to expand his skill as an artist. That’s commendable. Even more – he does so. Gabe and Tycho don’t have a very wide variety of facial expressions. They are often wearing expressions of disdain, indifference, occasional disgust… and often simply rage. A good variety, but we see it all the time – one reason why I have always liked it when a character gets a bit of a maniacal gleam in their eye. When Gabe gets a chance to draw a bit beyond his usual repertoire. Today is a good day. Tycho is stark raving mad and Gabe is confronted by horrors beyond mortal imagination. Now that’s a comic I can really get behind!